After the Crunch: Rubble and…Ewoks? Since I work near the Century/Aviation intersection where Metro is planning to build a light rail station, I’ve been watching the demolition of the old bridge with some interest. The northern rise is pretty much obliterated now. The southern section is down to a single wall. Here’s what it looked like three weeks ago, for comparison. Not only do we have “Endor,” and “Death” (spelled funny) in a lettering style reminiscent of the Indiana Jones logo…I swear someone wrote “Ewok” off to the right. Or at least “EW[head]K,” which amounts to the same thing. This entry was posted in Photos, Strange World and tagged Century Crunch, construction, SoCal, Star Wars on August 21, 2014 by Kelson. I was looking forward to checking out the aftermath of last weekend’s “Century Crunch” bridge demolition (see the before photo), but for various reasons I didn’t get a chance to really look at it until Thursday, when I finally felt up to walking down to the corner at lunch. 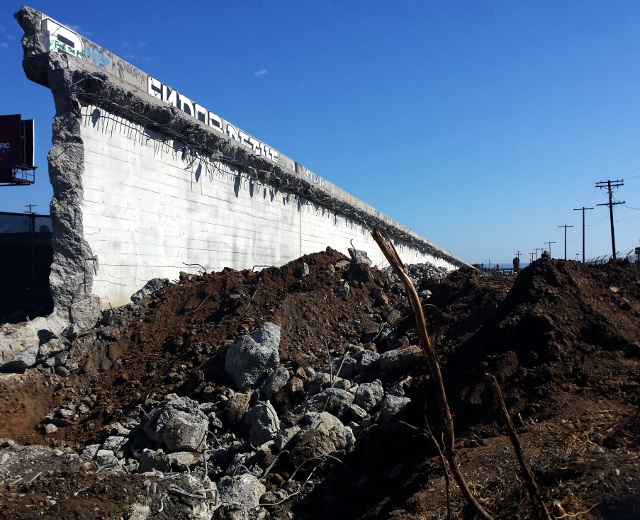 The most interesting part is the rise to the south of Century Blvd, where the remnants of the bridge come up to about 15 feet from the street. It’s fenced off, but of course when you’re walking by, the thin canvas they use doesn’t completely block your view. 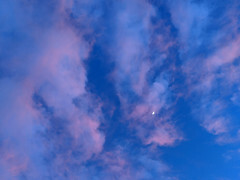 I was able to get my camera lens between two pieces of canvas to get the image here. It’s interesting that the ramp is hollow. I’m not sure what the normal design is, but I’d always thought that ramps like this were filled in with dirt, and that’s the impression I’d gotten from various projects I’ve seen in progress. Perhaps railroad bridges are different than freeway bridges? Or perhaps they emptied it out when they tore out the span? It makes it look like the entrance to a tunnel, sloping down into the earth. 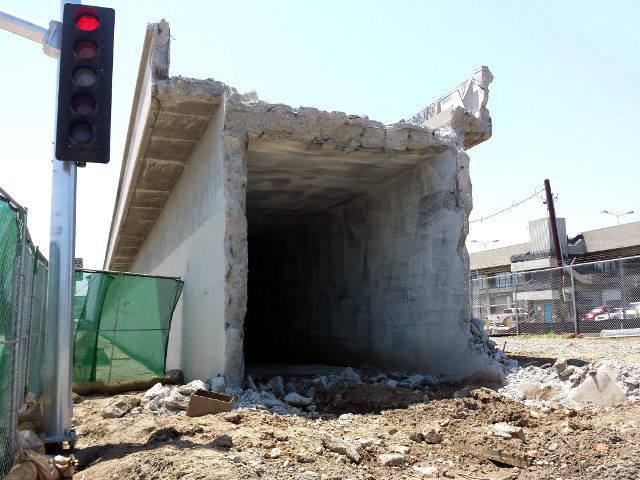 This entry was posted in Photos and tagged Century Crunch, construction, SoCal on August 1, 2014 by Kelson. 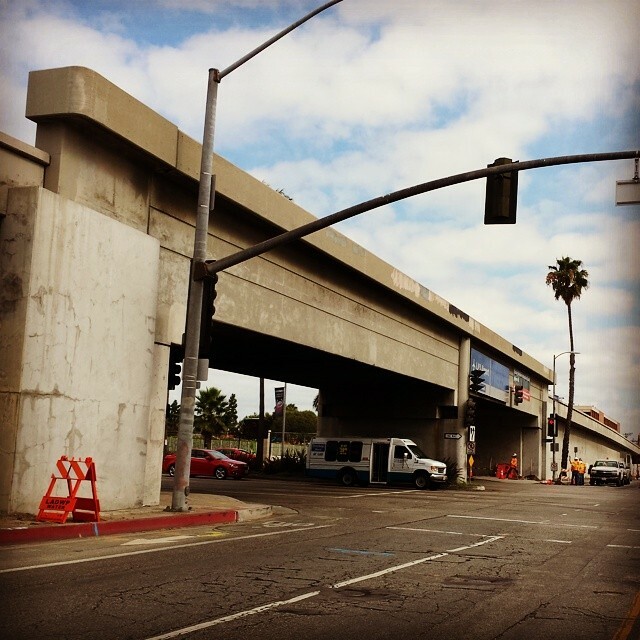 Next weekend, construction crews will tear out this old railroad bridge across Century Blvd near LAX to make way for a Metro station on the future Crenshaw Line. They’ve dubbed the road closure the Century Crunch. As of Thursday, they were already breaking down the parts of the bridge that don’t cross the street. I actually drive under this bridge every day on my way to work — that’ll be a change. It’ll be interesting to watch progress on the Metro station as well. It’s been a while, but when I first started at this job, I had a much longer commute, and I would drive part way to the end of the Green Line and take the train to the nearest stop, Aviation Station, which will become the transfer point between the Green and Crenshaw Lines. 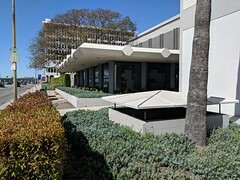 Another soon-to-be-demolished structure. 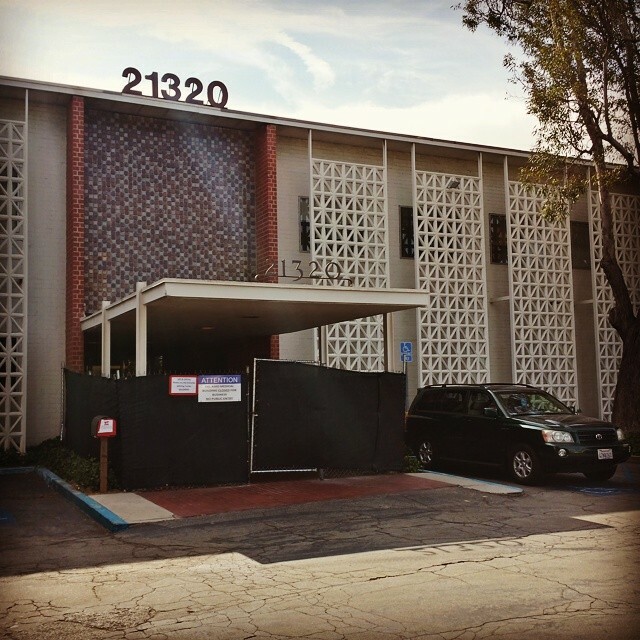 This old medical building in Torrance has a lot more character than the bridge, but it’s being replaced by something less exciting, IMO: parking for the currently-expanding Del Amo Fashion Center. As if the mall isn’t big enough already. Sure, parts of it needed renovation, but the parts that needed it the most haven’t been touched by the current project. 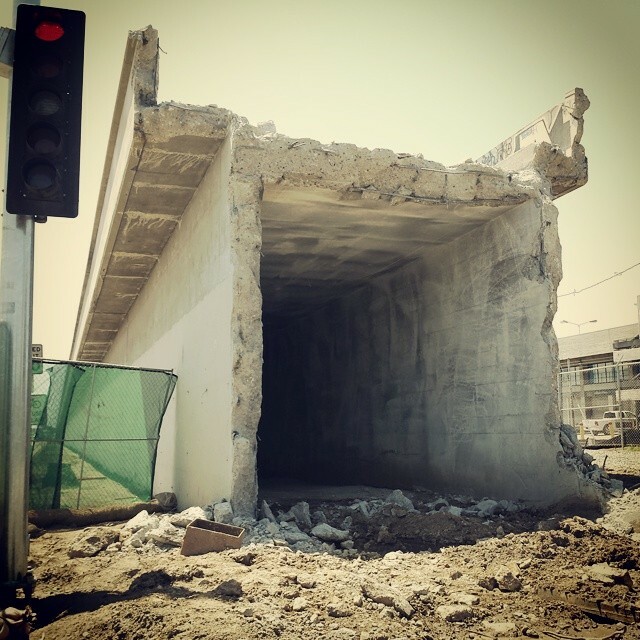 This entry was posted in Photos and tagged Century Crunch, construction, SoCal on July 20, 2014 by Kelson.